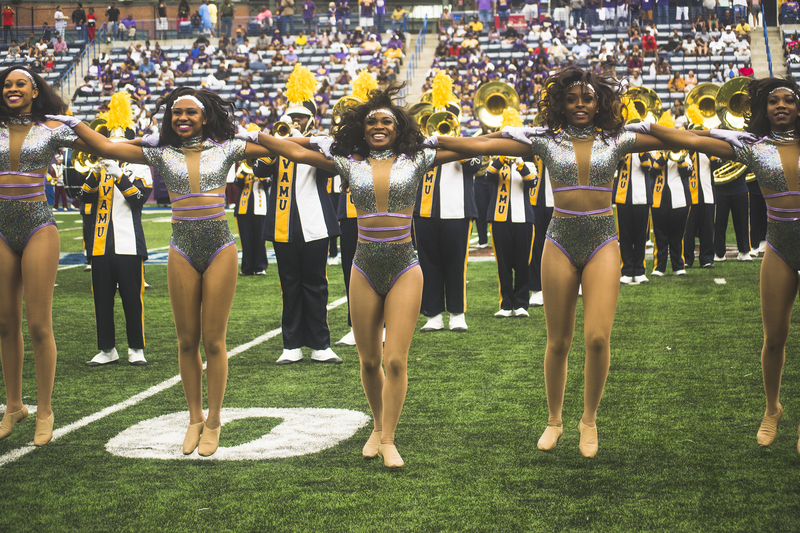 Prairie View A&M’s Marching Storm comes out the blocks with the first 2018 Band of The Week honor. Week One of college football came in like a storm last week,along with the official start of band season. Fittingly, our first Band Of The Week is the Prairie View A&M Marching Storm. At 275 strong, the Storm includes The Black Foxes, PVAMU’s dance squad that electrifies crowds all over the SWAC. And of course, there is the voice of the storm, T.T. ON THE MIC. T.T., AKA Tierra Chapman, is a former band member who now moves the crowd with her voice. Our Steven J. Gaither caught up with her during a break in the action during the MEAC/SWAC Challenge to chat about her roll and what it takes. We will pick a Band of The Week through the end of the season. The BOTW isn’t a declaration of a top band, it’s just our way of spreading love across the HBCU band universe. Congratulations to PVAMU’s Marching Storm and be sure to check out next week’s “No Huddle” show to find out who will get the spotlight next!